Components inserted into Polyester Zipper Pouch. 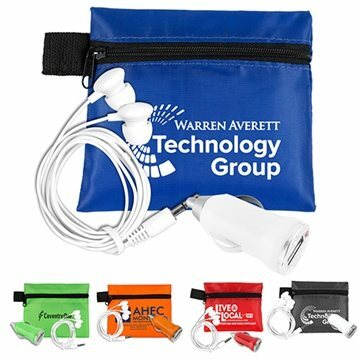 This Tech Kit provides the essential mobile and tech accessories you need for travel on the go. The service is excellent! I especially appreciated the discount! It looks great. The printing is excellent! Loved the final product and was exactly what we were expecting. It was exactly what I expected and perfect my intended use. I have no negative comments.